When the Civil War ended the Confederacy was beaten and most people in the South would have agreed to anything that the North presented regarding peace and return to the Union. The primary political policy goal of Lincoln regarding the war was the reestablishment of the Union and one of the military measures adopted by Lincoln was the emancipation of the South’s slaves who were an important part of the Southern war economy. “During the last two years of the war the abolition of slavery evolved from a means of winning the war to a war aim – from national strategy to national policy.”  By Lincoln’s reelection in 1864 that policy included the unconditional surrender of the Confederacy as well as the passage of the Thirteenth Amendment, while Lincoln himself advocated moderation in achieving the political and social goals of his war policy, as well as in the restoration of the Southern States to the Union, his assassination served to destroy that goal as his successor, Andrew Johnson, and the Radical Republican majority in Congress warred against each other in implementing the policy of Reconstruction. That change in policy, the complete abolition of slavery necessitated a remaking of the old South, a culture where economics, social standing and even religion was linked to the “peculiar institution.” In a sense Reconstruction was “what the war was about.”  Had Lincoln’s successor, President Andrew Johnson desired he could have gotten the South to accept almost any demands that he decided to place upon them. A Northern correspondent who traveled throughout the South in May of 1865 and surveyed the mood of the leaders and people “concluded that any conditions for reunion specified by the President, even black suffrage, would be “promptly accepted.”  But that was not the way of Andrew Johnson. Johnson set about to work with Southerners to affect a rapid reunion and to reestablish white rule in the South. He adopted a “minimalist process that would establish a mechanism by which former Confederate states could return to the Union with little or no change except for the abolition of slavery.”  The procedures Johnson established for the re-admission of states only allowed people who were eligible to vote in 1861 to vote. In effect this ensured a white only electorate, and excluded any free blacks. Johnson then began working to pardon former Confederates as quickly as possible to allow them to return to their political offices. Johnson would often issue hundreds of pardons a day, between June and August 1865, “the president awarded more than five thousand pardons in three states alone – Virginia, North Carolina, and Alabama.”  These pardons ensured that the former Confederates would never again have to worry about being brought up on charges of treason or war crimes, and no “federal law permitted them from voting once their states had been readmitted to the Union”  which under Johnson’s plan ensured that they would have the voted before any newly freed black in the South. 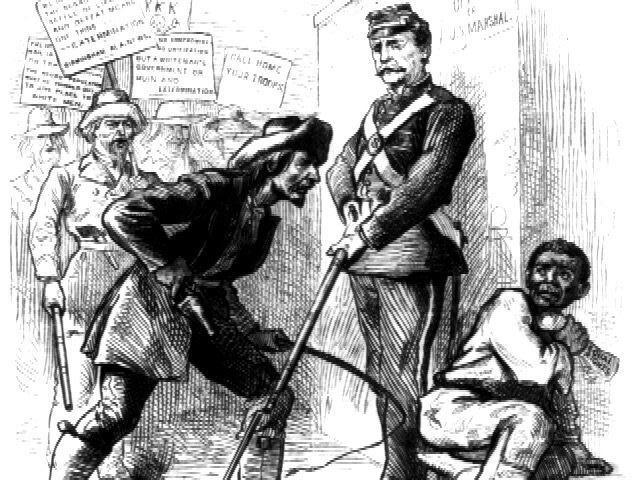 Johnson countermanded the orders of Union Generals in the occupied Confederate States to protect the rights of freed blacks further strengthening and emboldening those committed to restoring white rule in the South and regulating freed blacks to a state all but in name like slavery. Relieved at Johnson’s mild terms for reunion Southerners language included “defiant talk of states’ rights and resistance to black suffrage. My midsummer, prominent whites realized that Johnson’s Reconstruction empowered them to shape the transition from slavery to freedom and to define black’s civil status.”  Johnson’s policy set the stage for racial strife that in some places still has fully not ended. Just two months after Lee’s surrender of the Army of Northern Virginia at Appomattox, Richard Henry Dana, a Federal District Attorney in Boston, declared that “a war is over when its purpose is secured. It is a fatal mistake to hold that this war is over because the fighting has ceased. This war is not over…”  As Dana so succinctly noted, and Clausewitz so well understood, was that that war is a continuation of policy and politics by other means. The failure of President Johnson and so many others in the North to fully grasp this fact led to over a century of subjugation of emancipated African Americans by whites. The confusion and lack of determined purpose has fueled a continual racial divide in the United States that is still felt today. Defeated on the battlefield Southerners and emboldened by Johnson’s leniency, Southerners soon turned to political, psychological and even violent means to reverse their losses. There was a problem with implementing Reconstruction; when John Wilkes Booth assassinated Abraham Lincoln, the political leaders of the North could not agree on how to do this. 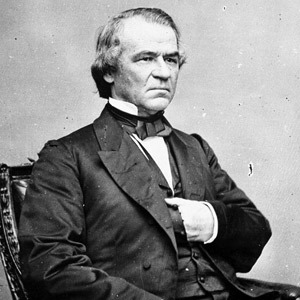 The new President, Andrew Johnson was probably the worst possible leader to lead the country in the aftermath of war for all practical purposes Johnson was a Democrat who believed in white supremacy, he had been brought onto the ticket for his efforts to keep Kentucky in the Union and to support Unionist elements in Tennessee. While his selection helped Lincoln in parts of the North and the Border States it was a disaster for the post-war era. Johnson’s approach to reconstruction was very simply to “impose minimal demands on the South. He required only minor concessions from the former Confederates before allowing them to resume their political rights and retain their land. As for freedmen, he seemed to think that the needed no further protection beyond the fact of their emancipation.”  Johnson’s attitude regarding freedmen was quite common, even men like William Lloyd Garrison who had spent his life in the cause of abolitionism believed that emancipation and abolition and the passage of the Thirteenth Amendment was the end of his work. He urged the dissolution of the American Anti-Slavery Society in May of 1865 declaring, “My vocation, as an Abolitionist, thank God, is ended.”  His suggestion was rejected by the membership, but it was a harbinger of things to come.